I made these fun recipe cards. There are THREE DIFFERENT sets…. Thanksgiving, Fall, and Sunflowers. Each set has three designs. Download one set or all three. They are completely FREE!!! You could fill in your favorite recipes and hand them out at cookie swaps, pot lucks, moms night out… or any number of events that happen this time of year and require you to bring a treat. 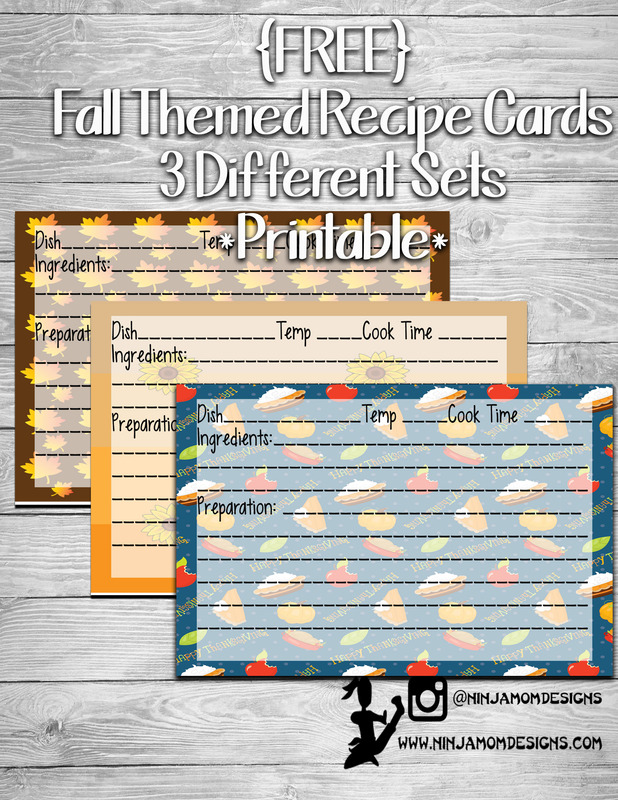 Today, you can download 3 Different Themed Recipe Cards. Each page has three different designs. Each card is sized 4 x 6 inches. These are FREE printables! How does that work, you ask??? – Save to your computer so you will ALWAYS have these fun recipe cards on hand. – Cut Out Your Cards and Write your Favorite Recipes! If you print and use these in your planner or kitchen, tag @ninjamomdesigns on Instagram so I can see them. I love to see other people using my FREE printables. I would love to be inspired by you as well!